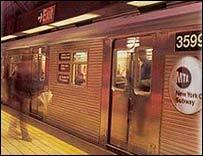 Once the symbol of New York urban living, the subway token is being abolished after 50 years. For millions of commuters on the New York subway system, an era draws to an end on Saturday when the last subway token will be sold in stations across the system. The subway token, a metal disc inserted in the turnstile, will be replaced by a plastic MetroCard, which is already used by a majority of riders because it offers weekly discounts. The change takes place as the subway system faces a financial crisis, forcing it to raise fares from $1.50 to $2 per ride from 4 May. 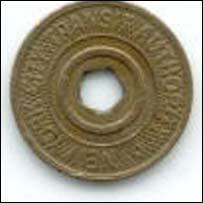 Fare increases have in the past been accompanied by a newly issued token, whose shape and size were altered each time. The MetroCard, first introduced in 1994, was slow to catch on, especially among older riders. "For a lot of people, being forced to move to the MetroCard was like my 84 year-old mother being forced to use a computer," said John Mollenkopf, director of the Centre for Urban Research at City University. Some people believe the subway token will become a collectors item, or least a novelty item, made into cuff-links and tie-clips. But the New York City transit agency will retain up to 60m tokens for the time being, as well as large amounts of the older tokens in storage. For the first 44 years of its existence, since the first line was opened in 1904, the New York subway system retained the nickel fare, and only that coin, worth five cents, would open the turnstiles. The fixed fare - something which no politician of the time dared oppose - helped bankrupt the system by the l930s, leading to its takeover by the city government in 1940. The fare was first raised to a dime, or 10 cents, in 1948, but when it was increased to 15 cents in 1953 engineers said it would be too difficult to redesign the turnstiles to accept two different coins. The first token had the letters NYC in the middle, with the Y stamped out. More than two million people ride the 722 miles of the New York subway system each day, making it by far the most heavily travelled public transportation system in the United States.